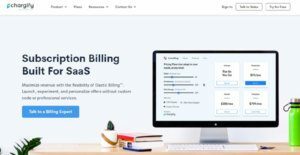 Chargify is Subscription Billing built for SaaS. Most vendors support your basic billing needs and so are Chargify. However, Elastic Billing goes beyond basic, supporting millions of complex scenarios and any business structure. Chargify empowers your entire team to quickly launch products, sign up customers, and manage subscriptions. Whether your business is a new startup or an established company that bills thousands of clients per month, Chargify can make it work for you. Its real-time dashboard allows easy access to customer insight, signups, revenue, and cancellations. You can increase your company revenue and optimize sales conversions by testing various subscription plans as well as freemium pricing models. With the solution’s business intelligence tools, your business will make more informed decisions and prioritize on what’s important: the growth of your company. Chargify works with various payment gateways, allowing you to be confident with your compliance and billing. You can immediately accept payments with a branded payment page. You can also integrate the tool’s API into your website. You can get started for free. There are no set up or transaction fees. There will also be no contracts to sign. This app is created to make running your subscription-based company a snap. The tool can send emails, help take care of declined or expired, and automatically charge customers without a hitch. Chargify can be used by any tool, from non-technical business startups to huge enterprise firms with complex needs. Chargify offers a fixed monthly pricing structure. It does not take any percentage of your revenues. In addition, is offers 24/7 phone support, something that other billing solution providers do not offer. You can benefit from top integrations such as Zferral, Wufoo, Salesforce, Xero, and Shopify. Chargify likewise integrates with Zapier to connect your business to hundreds of other Web apps. Merchants can use “out of the box” features like public sign up pages and the provided billing portal for customer-facing subscription management to get up and running in minutes – no development work required. For more technical companies with development resources, Chargify can be seamlessly integrated into to any website or application with a robust, easy to use API. Chargify has a fixed monthly pricing structure and does not take a percentage of revenue. When ARPU (average revenue per user) crosses over $30-$40/month for products or services, Chargify becomes the clear cost winner. Chargify is the only billing software provider in the space that offer 24/7 phone support. What Problems Will Chargify Solve? Collecting Taxes – Managing sales taxes for customers across multiple states, cities, and counties can be a tedious job. Chargify has partnered with Avalara, the leading cloud-based software for sales tax management, to provide access to Avalara AvaTax, delivering instantaneous sales tax decisions based on precise geo-location in more than 10,000 taxing jurisdictions. If you need to collect sales tax, just enabled the Avalara option and define where tax are applicable, and Chargify will calculate, itemize, and bill the correct sales tax based on the customers shipping address or billing address. Reviving At-Risk Accounts – When recurring revenue runs your business, it is important to reduce churn by keeping the customers you have. Dunning is the process of communicating with customers to ensure payment of past due accounts prior to account cancellation. Chargify’s dunning management options make it easy to configure payment retries, grace periods, and customer communication about failed transactions. A successful dunning strategy using Chargify, can help retain 20%+ of revenue that may otherwise be lost due to credit card declines and other payment failures. Sales and Marketing can move fast – Chargify’s ease-of-use for less technical team members such as Sales and Marketing helps eliminate roadblocks. Sales can easily create custom pricing to help close deals. Marketing can spin up coupons and promotions to accelerate campaigns, or create new plans for a/b testing. This is all easily accomplished via the admin UI without having to wait for development resources. Enterprises have different wants and requirements and no software application can be just right in such a condition. It is futile to try to find an ideal out-of-the-box software app that fulfills all your business requirements. The wise thing to do would be to modify the system for your unique needs, staff member skill levels, budget, and other aspects. For these reasons, do not rush and invest in well-publicized trendy solutions. Though these may be widely used, they may not be the perfect fit for your unique wants. Do your research, check out each short-listed system in detail, read a few Chargify reviews, speak to the vendor for explanations, and finally select the app that presents what you need. How Much Does Chargify Cost? Chargify offers a 30-day free trial and a quote-based subscription model. You can contact the vendor for more details. We realize that when you make a decision to buy Accounting Software it’s important not only to see how experts evaluate it in their reviews, but also to find out if the real people and companies that buy it are actually satisfied with the product. That’s why we’ve created our behavior-based Customer Satisfaction Algorithm™ that gathers customer reviews, comments and Chargify reviews across a wide range of social media sites. The data is then presented in an easy to digest form showing how many people had positive and negative experience with Chargify. With that information at hand you should be equipped to make an informed buying decision that you won’t regret. What are Chargify pricing details? What integrations are available for Chargify? Pros: Chargify is a friendly, simple, and easy to use platform that has all the features necessary for running a successful online sales business. Its dashboard is simply powerful: you can use it to check your revenue performance, and to control the number of sign ups all the time. Neat reporting is also included in the benefit package! We use it every day, since it is involved in all product updating, communication and refunding processes, and our favorite part is that subscriptions can be altered. Cons: I like everything about Chargify, and I think everybody does. Pros: Installation was not as painful as it can be sometimes, and we quickly understood we were dealing with a well-integrated tool. The decisive criterion for us was Wufoo integration, which is very well done. The product comes with excellent support which handles issues in less than an hour, while the platform is powerful enough to deal with multiple recurring donations per time. I also recommend it because of neat reporting, I think that matters a lot to a streamlined workflow. Cons: For me, the product is still intermediary, probably something alike credit card processors for online giving. I wasn't blown off my shoes, and I'm still looking for a platform that can host my web forms and do independent processing of my transactions. Meanwhile, I will continue working with Chargify, because I think it is worth its price. If you need more information about Chargify or you simply have a question let us know what you need and we’ll forward your request directly to the vendor.